The Union card symbolizes unity and wholeness. It represents our relationship with our self and our relationship with the world around us. It represents the harmony that arises when we are in alignment within, and with both the seen and unseen worlds around us. To achieve this centered state is our fifth reason for being. Who am I? What is my purpose? Why am I here? Self-inquiry puts our feet upon the path to wholeness. It is part of our life quest, and only in asking questions and seeking answers do we become whole. It is a journey that manifests in self-discovery. We come into the world innocent and pure. While in the womb, our soul is still as one with the Source of All – the Void – the Cosmic Womb from which all came to be and all will return. Our soul remembers that connection. The soul remembers its unlimited potential. It remembers that it is whole and divine. This knowledge, and all that we experienced before taking our first breath in this life, resides within our unconscious mind, where it could motivate and guide us, if it were not for the fact that from birth we experience a life that is conflicting in every way. The Union card represents the bringing together of many aspects of our world that we have been taught to separate from the whole. All is connected – as above, so below. The universe in which we dwell is multifaceted and whole. The earth upon which we dwell is multifaceted and whole. All that dwells beside us upon this blue-green earth is multifaceted and whole. We, humanity, are multifacted and whole and we have a symbiotic relationship with that whole. As the dominant species on the planet, the very health of the whole planet is dependent on our own health and unity as a species, and so we must reconnect and integrate and become one with all once more. 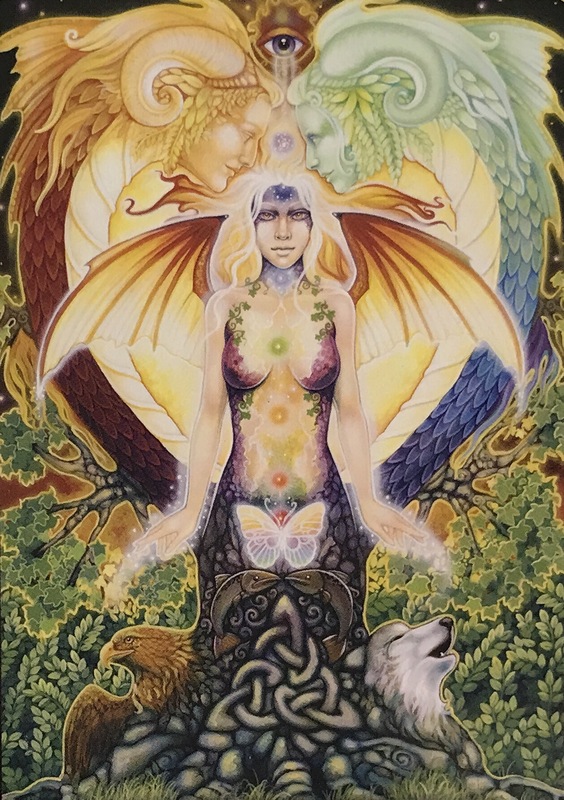 This entry was posted in Artist, Deck Review, Featured Card of the Day, General Tarot, Readings and tagged Dreams of Gaia, Ravynne Phelan, Tarot, Union.